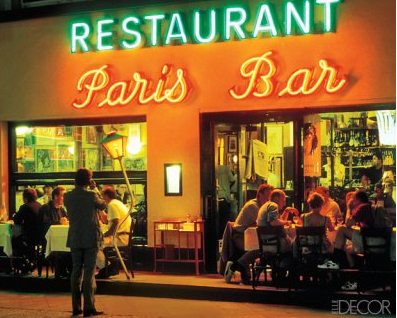 I have never met anyone, Berliner or not, who did not wrinkle their nose when speaking of one of Berlin’s most famous dining institutions, the Paris Bar. The food is mediocre, the décor dusty, and the waiters rude even by French standards (the Germans have a word for rude Berliners; they are called Berliner Schnauzers, like the dogs). Yet sooner or later, everyone in Berlin ends up here—directors, German movie stars, writers. I myself have dined there three times in the past week, though only once by choice. And so, of course, this is where I end up on my last evening in Berlin. The Paris Bar. Being told I cannot sit at one table because it is reserved, though there is no sign on it and, while I dine, no one ever sits there, and being completely ignored by my waiter who stands just outside the front door morosely watching the traffic go by and smoking Gauloises. When he finally deems to come over, he gives me a German “pffff” when I order the lamb cutlets, as if he cannot believe I have interrupted his philosophical musings on the Blvd. Kantstrasse for such a plebian order. The German mother and her twenty-something daughter dining next to me get the same reaction when they tell the waiter they want to split a dessert, and they both shake their heads in disgust at the waiter’s surliness before putting their hands over their mouths and giggling. For this is the point about the Paris Bar: It is such a rude establishment and so counter to the general good manners of Germans that it is, in and of itself, an entertainment in the city. Like going to a show. To further annoy my waiter, I order an espresso after my meal and just as he delivers it, the Polezei pull up across the street, followed by a tow truck. Two policemen, along with the tow truck driver, huddle around the old Trabi that I have been enviously eyeing for weeks. It’s the same one whose owner told me I couldn’t drive it because it didn’t have an engine. The tow truck driver quickly hooks up the little cardboard car and off it goes. One less sad old East German Trabi on the streets of der neue Berlin. As the tow truck passes by the restaurant, the Trabi dangling behind like a too-small fish, the woman at the table next to me points to a hand-painted sign hanging from the ceiling of the Paris Bar: Stand Still and Rot. We smile at each other. In Berlin, this is more than just a saying. It is the zeitgeist of a city always changing. I’ve had the worst insomnia in Berlin. In fact, I can’t remember the last time I got more than two or three hours of sleep. So last night, at four a.m., just as the sun was coming up over the Brandenburg Gate outside my window, I got up and began combing my city map, lookng for the intersection of Mehringdamm and Yorchstrasse, which is where Herr Lubo had told me much earlier in the evening that I would find the best currywurst in Berlin. If you don’t know, currywurst is to Berliners what a good kosher dog is to New Yorkers. What is it? Just a pork sausage cut into slices and seasoned with an oddly addicting curry ketchup. It is the fast food in Berlin and during my time here I’ve gotten completely addicted to them. You can find decent currywurst on almost every street corner in Berlin, but last night, as I was telling Herr Lubo about my delectable evening at Henne, he told me that if I wanted to sample the city’s finest currywurst before I left, I had to go to a stand called Curry 36 late at night. “It’s where the Nutten, Junkies und verrückte Leute go,” he said. Hookers, junkies, and crazy people. “If you take more than ten seconds to order, they start to get a little angry. But the wurst and the sauce are homemade and it’s worth it,” he told me. 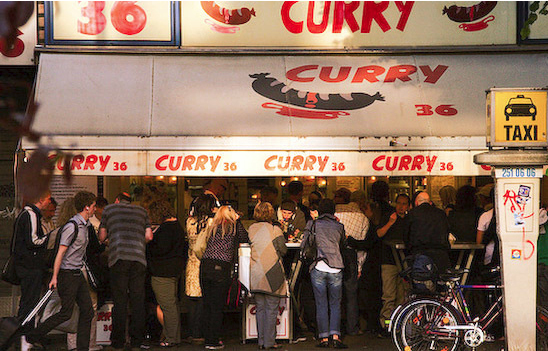 So I’ve been lying in bed thinking about currywurst since midnight and now I’ve decided I need to go find this place. I pulled on my jeans and a shirt and hurried down to the lobby where a solitary young woman dozed behind the front desk and went out the door, wondering if I wasn’t a bit crazy to walk a good two miles in the dark in search of a hot dog with spicy ketchup. But waiting just outside the Hotel Adlon was a taxi and slumped behind the wheel was a young Russian—maybe 25 or 26—named Igor who, when I asked him if he spoke English said, “You bet, Joe,” and then to prove it, turned up the Beyonce CD he was listening to and began to happily sing along to “Crazy Love,” giving a lie to the dour Russian stereotype. I shouted over the music and Igor’s singing to ask him if he could take me to Curry 36. A few minutes later we were there. I asked Igor to wait for me. His English seemed limited but very, very good. At Curry 36 I found two extremely haggard looking cooks wiping down their stainless-steel holding trays which were remarkably empty of currywurst or any other sort of sausage for that matter. Everyone speaks English in Berlin, even the tired cooks at Curry 36 who told me they were finished, closed, kaput. “We close at four,” one said, shrugging. Then she pointed down the street where there was a sidewalk kiosk with the words CURRYWURST painted on the side. I hurried down. Two very stoned German students told me in German that they had just ate three currywursts and if I would order seven more, splitting them with them, the three of us would get a free one. It sounded tempting but I knew I’d have to partake in their hubbly bubbly in order to find the appetite and that didn’t seem like a particularly wise idea. Instead, I ordered just one. With a roll. And climbed into the back of Igor’s Mercedes with my little paper tray oozing with sweet ketchup and grilled sausage juice. “Curry 36 was closed,” I told Igor. Still, as we pulled up to the Adlon, I couldn’t help wondering if the currywurst was even better at Curry 36. Maybe I’ll go back tonight. Although my pal at the Hotel Adlon, Herr Lubo, has made reservations for me this evening at one of Berlin’s hottest new restaurants, I’m feeling less than enthused over the idea of a drawn out multi-course meal. So I call and cancel. 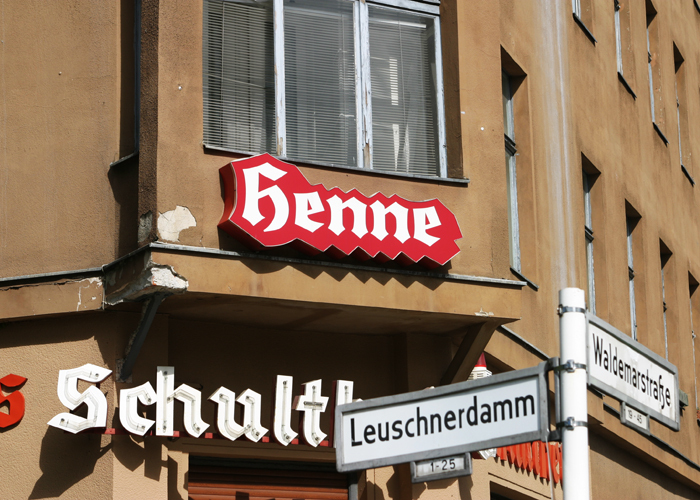 Instead, I catch a taxi and head for one of my favorite secret haunts, Henne, in a decidedly lackluster neighborhood in what used to be one of the economic “dead zones” of East Berlin. Decorated, if you can call it that, with deer antlers on the walls and an ancient collection of dusty German beer bottles, the bar and adjoining dining room are small and smoky. It reminds me of a blue collar bar in Pittsburgh or Detroit. Despite this, the place was jammed. I was informed by the hostess (who was also the bartender and, later my waitress) that the wait would be at least an hour. So I sat at the bar drinking a flavorful country beer, Fränkisches Landbier, served in a heavy ceramic stein, admiring a framed photo behind the bar of JFK along with a letter from the State Department dated May 1, 1963, thanking the restaurant for inviting the president to the restaurant for a meal (which, evidently, he declined). The chicken, however, is incredible. In fact, I think it’s safe to say that it’s the finest chicken I’ve ever had. Crisp, moist, flavorful. It was so good that when the hostess/bartender/waitress refused to tell me how it was prepared, I devised a ruse to sneak into the kitchen and see for myself. But my plot was foiled by the lone cook, Andreas, who, though happy with the beer I brought to him as tribute to his poultry cooking, refused to let me see around his wide back and into the cramped kitchen where he performs his wonders. When I returned to my table, my waitress/bartender also scolded me—then brought me a shot of a mystery eau de vie, promising that if I could identify the liqueur’s fruit, she’d reveal Henne’s secret chicken recipe. I guessed cherry but, alas, it was strawberry. No secret Henne chicken recipe for me. A reader tells me that the easiest way to start a Trabi is to push it and then hop in. Sort of like what she's doing. The engine is so light that it can be changed by one person lifting it out (which perhaps explains why the Trabi eternally parked in front of the Paris Bar has no motor). In Trabi rallies in the former East Germany, it was common to carry a spare engine in the boot in case of breakdowns. The fuel supply is gravity fed, and the petrol tank is mounted directly above the engine. The Trabi had a galvanized steel chassis (dipped in bitumen for rust protection), with panels of compressed plastic and cotton “alloy” screwed into the steel frame. Consequently it is very light, which gives it excellent breaking and acceleration considering its primitive drum brakes and a 28 horse power engine. However, its performance is similarly reduced with any sort of a head wind, and is reduced approximately by 10% for each additional passenger. The easiest way to start a Trabi, he says, is to push it and then hop in. Still, it would be worth a go, don’t you think? I wanted to drive this old East German Trabi, parked in front of the Paris Bar, but it didn't have an engine. Photo by David Lansing. “It is not possible,” he says, and despite my attempts to resuscitate the conversation, our little chat is over. Suddenly this taxi driver, who minutes before had told me in perfect English that I was staing at the best hotel in Berlin, in his “humble opinion,” can speak no English. 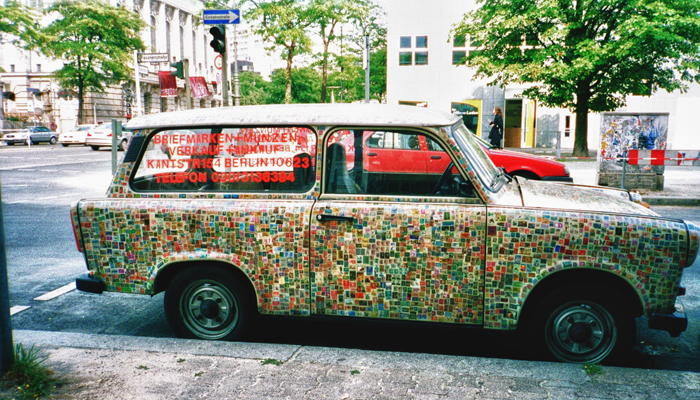 Mention of the Trabi, a symbol of the old GDR days, has disturbed him. Trabants—or Trabis, as they are affectionately called—are odd, boxy East German cars made out of plastic and wool with two-cylinder engines better suited to a lawnmower than an automobile. Originally intended to be a closed motorbike, Das Kleine Wunder (the small wonder), first built in the early ‘50s, somehow managed to stay in production until 1991 when the German government, more concerned with pollution than safety, closed the remaining automobile plants and began a concerted effort to get all Trabis off the street. Once considered embarrassing symbols of socialism—ugly but practical, inefficient but still somehow managing to work—they are sought after by students and those with a lingering case of ostalgie. When I first came to Berlin shortly after the fall of the Wall, they were everywhere; now they are as rare as good Russian cigarettes. Which is, perhaps, why I badly wanted to drive one. I got a phone number for a Trabi car club in Berlin but could never get anyone to call me back. A Trabi parked on the street across from the Paris Bar had a phone number painted on its window advertising a rare stamp and coin shop, but when I spoke with the owner I was told the Trabi had no engine and was simply used as a parked billboard. “Sooner or later, I think they will take it away,” he said. Still, I’m determined to find a Trabi I can actually drive.